A frequent issue in family law revolves around a child’s privilege with his or her therapist. On occasion, one of the parents will attempt to secure the therapy records against the wishes of the other parent and sometimes, against the wishes of the Guardian ad Litem and the therapist. A recent Wisconsin Court of Appeals decision in a non-family law case may create serious problems in keeping these records private. In State v. Denis L.R., No. 03-0384 (Wis. Ct. App. Feb. 4, 2004) (recommended for publication), Denis L.R. was charged with repeated sexual assault of his then three-year-old granddaughter, Kirstin. Denis filed a motion asking the court to conduct an in-camera inspection of Kirstin’s counseling records, arguing Kirstin had told her counselor that nothing happened with her grandfather (Denis) and on other occasions indicated that something had happened only once during the charging period alleged in the criminal information. The court held a hearing on whether Dawn, Kirsten’s mother, waived her parental privilege on Kirstin’s behalf by voluntarily disclosing a significant part of the communication between Kirstin and the therapist to a third party, Denis’ mother and Kirstin’s great-grandmother, Helen. Dawn testified that she did not intend to waive any privilege, but instead was discussing Kirstin’s well-being with a trusted family member. The trial court, Sheboygan County Judge Gary Lanhoff, concluded that Dawn’s disclosure to Helen constituted a waiver of Kirstin’s privilege. Dawn then moved to intervene in the criminal case to protect Kirstin’s privilege. The motion was granted and Dawn appealed the courts’ order concerning privilege waiver. The District II Court of Appeals affirmed. Adopting the rationale in Sampson Children’s Trust v. Sampson 1979 Trust, 2003 WI App 141, 265 Wis. 2d 803, 667 N.W.2d 831, review granted, 2003 WI 140, 266 Wis. 2d 60, 671 N.W.2d 847 (waiver of attorney-client privilege need only be volitional, not intentional), the opinion, penned by Judge Neal Nettesheim, rejected Dawn’s claim that her waiver of Kirstin’s counselor-patient privilege required intent. The court of appeals also rejected Dawn’s contention that the statements made by Kirstin, which were relayed by Dawn to Helen, were not a significant part of the matter or communication. Lastly, the court of appeals rejected Dawn’s position that the trial court should have secured a written release from Dawn or a statement of voluntary waiver on the record. The potential effect in family law cases is severe. The value of the therapeutic relationship may exceed the value of the use of communication between the child and the therapist in a custody action. It is difficult enough for most therapists to encourage children to be open without having to discuss the nuances of waiver of privilege by the child’s mother. Absent in the discussion by the court was any consideration of the whether the mother was authorized by the child to divulge the confidences. Rather, it was simply assumed that such was the case. Many times, a competent Guardian ad Litem can convince the parties to avoid interfering with the therapeutic relationship. Often, both parents understand that the value of the therapeutic relationship to the child exceeds any benefit to the parent in the litigation. On other occasions, however, the GAL has to threaten a party that attempts to subpoena information will result in an adverse recommendation by the GAL. The problem which might arise from this decision is those cases where a parent does not recognize the value of the therapeutic relationship and the GAL is either ineffective or also does not appreciate the importance. If a parent is aware of what a child told a counselor, which happens frequently, and shares that information with a third party without recognizing the legal effect of doing so, the therapeutic relationship may be destroyed. And, that destruction may exceed the evidentiary value of the communication. 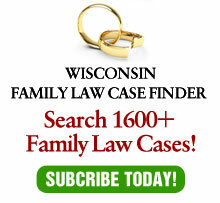 This article originally appeared in Wisconsin Journal of Family Law.